You don’t know me from Adam’s house cat, but just like everyone else on the Internet interested in college football, I’ve got an opinion I’d like to share with you. Do you remember that superb episode of Seinfeld where George Costanza finally acknowledged how abysmal his natural instincts were in dealing with decisions he faced everyday? He decided to deal with his realization of this by recognizing his instincts and then doing the exact opposite. Of course, as soon as he did that, everything went perfectly for him. Now, look at your situation. Your last four hires for the position of head football coach have been Dubose, Franchione, Price and Shula. 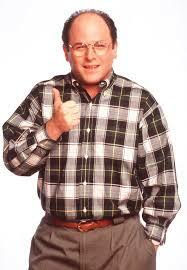 Let’s face it – when it comes to hiring and firing, you are George Costanza. So what do your instincts have you doing now? You’re chasing a series of big names, offering ridiculous sums of money and probably making all sorts of promises you’ll regret in six months, if not sooner. Take George’s advice: do the opposite. Go find an assistant coach who’s bright and hungry, who wants to prove he can run a big time program and who will put up with the baggage that comes with the Alabama coaching job. He won’t cost you $3+ million a year, either. Lucky for you, there’s such a guy just down the road. Hire Al Borges. Not only do you get someone with all the attributes I just mentioned, but you also get someone familiar with SEC defenses and with how things are in your state. Even better, you kneecap your most bitter rival by taking its best assistant coach. You’ll probably get bonus points for screwing up Auburn’s bowl game preparations. And you wipe the smug smile off of every Auburn fan’s face that you’ve been seeing for the last two weeks, if not longer. So ignore that little voice inside you’ve been listening to for too long. Do the opposite. Comments Off on Hire That Man! If you’d like to see a column designed to maximize the anxiety of college football fans with regard to head coaches’ whereabouts in this season of job changes, then, brother, Tom Dienhart’s piece in today’s TSN is your cup of tea. Hell, he even hits Vandy. Like I’ve said in the past: Miami has talked to Georgia coach Mark Richt. Does that mean Richt will take the job? No, but they are/have talked. I hear Richt isn’t happy-smiley in Athens. That’s Joe Tereshinski II, who’s got another son trying to beat Tech this weekend (John is a tight end with Wake Forest). OK, start with Georgia thinking it had a deal with Oregon State for a three game series (two in Athens, starting in 2007 and one in Corvallis). Then, Oregon State backs out. So Georgia’s got a hole in its schedule for next year. Who does Damon Evans turn to for some help? Georgia has enlisted the help of ESPN in finding a game. The network is making calls on behalf of the Bulldogs and trying to put together an attractive television matchup. …In a deal brokered by ESPN, Oklahoma State will open the 2007 football season at Georgia. In the 2009 opener, in the first game played at the completely renovated Boone Pickens Stadium in Stillwater, Georgia will visit the Cowboys. As a reward for having accepted the trip to Georgia, ESPN officials have guaranteed OSU two additional ESPN exposures during the 2007 season. Oregon State athletic director Bob De Carolis told The (Portland) Oregonian that OSU was considering a one-game contract to open the 2007 season at Jordan-Hare Stadium. “There’s an offer on the table and there’s a lot of money involved, but we’ve got to think about that and take a look at a lot of different things,” De Carolis told the newspaper. Boy, that sure is cozy. Makes you wonder what ESPN offered for the Auburn matchup that it didn’t offer for the Georgia matchup.